Maximum size: about 200 mm. Identification: This species is one of the largest Hawaiian nudibranchs. Mature animals are crimson, usually with patches of opaque white. When the animal is at rest, the mantle edge is rolled but, when disturbed, it's flared revealing a yellow-white margin. The oral tentacles are unusual in that they resemble tiny hands. As with other species of Hexabranchus, it undergoes complex changes in color and form as it matures. Very young animals are translucent-cream with faint red lateral patches on the notum and a yellow mantle margin. In maturing animals, the lateral patches darken and a submarginal red band appears. As the animals reach maturity, the rest of the notum darkens to red obscuring those features and opaque white patches may appear, particularly in the areas between the original lateral red patches. However, the amount of opaque white in mature animals is highly variable. (Note 1) In very large animals, the spotting may become finer (but more extensive) and the white patches may become less bright/well-defined. At all stages, the yellow-white margin is retained. It can be distinguished from Hexabranchus pulchelus by the presence of a yellow-white marginal band at all sizes and the lack of violet spots in juveniles. See the article on this site for further discussion. Distribution: Big Island, Maui, Lanai, Molokai, Oahu, Kauai and Midway. Taxonomic notes: This species is illustrated in Bertsch and Johnson, 1981 as Hexabranchus sanguineus. It's also listed as H. sanguineus in Hoover, 1998 & 2006 (left photo) (corrected in 5th printing). The species name means "gold margined" and it is one of the species commonly referred to as the "Spanish dancer" in Hawaii and elsewhere. In the 5th printing, Hoover, 2006 refers to is as the "yellowmargin Spanish dancer." It was first reported from Hawaii in Ostergaard, 1950 (as Hexabranchus sp.). Photo: PF: Keopuka Rock, Maui; Sept. 2, 2007. Note 1: We've seen photos of animals with extensive white pigment on the notum and no white pigment on the notum copulating (supporting lumping the two extremes). Note 2: On Maui, we've only seen this species resting under shaded ledges during the day or crawling actively at night. However, on May, 3, 2012 we observed at least seven animals crawling in the open by day in tide pools at Po'ipu Beach Park, Kauai. The following night, when we returned to the same pools, we found none. This suggests more flexible behavior than our Maui observations with at least some diurnal (or crepuscular?) activity. The daytime sightings were in the morning under cloudy conditions. Note 3: On May 10, 2012 at Ho'ai Bay on Kauai, Darcy Kehler found a large convex crab, Carpilius convexus, feeding on a mature H. aureomarginatus in shallow water. 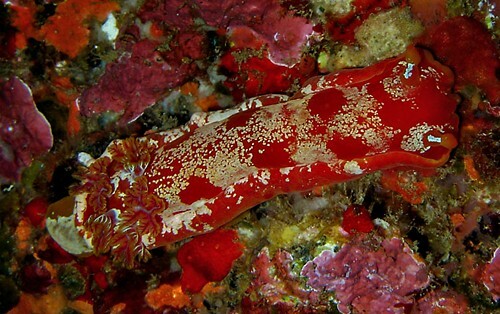 The nudibranch showed extensive damage to its mantle and had secreted a large quantity of mucus. So, it may be preyed on by some crustaceans in spite of its chemical protection.